Whether you’re a contractor, electrician, or HVAC specialist, a high-quality ladder is an important part of your equipment inventory and an expensive investment. If you store your ladder in the bed of your work truck, you not only take up valuable space that could be used to store other tools, you also put your investment at risk. Fortunately, Adrian Steel has a wide selection of durable ladder racks that keep your ladder safely stored on top of your commercial truck. Why Adrian Steel Ladder Racks? With a 250lb payload capacity, LoadFlex is one of the hardest-working truck ladder racks on the market and its unique design allows it to be installed without cutting or drilling. Equipped with uprights that are easy to put on and remove, the LoadFlex is also perfect for use on trucks that serve as both commercial and personal vehicles. The LoadFlex also comes with easily adjusted rest arms, slot-through bolt design that prevents separation, and plastisol rung stops and rope hooks. LoadFlex racks are available for both full and midsize trucks and fit all late model GM, Ford, and Dodge trucks. 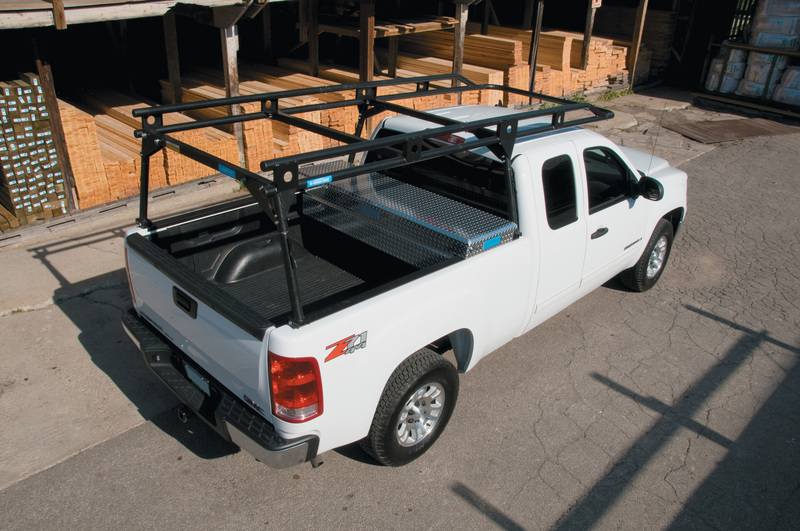 If your work truck has a commercial cap, the Grip-Lock is the ladder rack for you. Designed with an outer rail and horn, the Grip-Lock makes loading and unloading a snap, and the lockable gripping mechanism firmly secures one to two ladders without creating vibration wear. The Grip-Lock is available in 5’ and 6’ lengths between the cross supports and works with 6’, 7’, and 8’ pickup bed lengths. With Adrian Steel, you know you’ll get the toughest truck ladder racks available. We are also committed to providing you with the best possible service. From the first phone call inquiry to the final installation, we are dedicated to ensuring that your upfit experience with us a pleasant and successful one. Interested in learning more? Please visit Adrian Steel’s website. You may also contact us online, or call us at 800-677-2726. Connect with Adrian Steel on Social Media for more industry tips and tricks!